Five pairs of tickets to see Evangelion 3.0 will be given away to participants tomorrow. 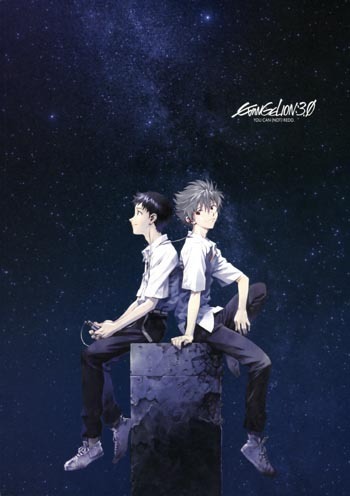 Evangelion 3.0: You Can (Not) Redo hits theaters in the United States and Canada this Friday. For fans who haven't already booked tickets to see the third rebuild movie in the well-known series, FUNimation is offering a chance to win a pair of tickets until tomorrow night. Fans can enter through Facebook and/or Twitter. On Facebook, answer the question, "What are you looking forward to most about seeing Evangelion 3.0 on the big screen?" on the official Facebook page. On Twitter, participants can enter by tweeting to FUNimation (@FUNimation). Note: Twitter participants should include the hashtag #YouCannotRedo and include the following url: http://funi.to/19XGOIZ. In addition, Facebook entrants must "like" the official Facebook page, and Twitter entrants must be following the FUNimation twitter account. Participants have until today at 6 p.m. EST to enter. FUNimation has five pairs of tickets to give out. Five winners will be picked by random - three from Facebook and two from Twitter. Winners will be notified tomorrow via Facebook and Twitter, and they will need to provide a valid photo ID to claim tickets at will call. Tickets are valid for any participating theater, a list of which is provided here. Some showings will have a viewing available in Japanese with English subtitles while others use the English dub. Evangelion is regarded as a classic. The rebuild movies, of which there will be four, or a reboot of the original Neon Genesis Evangelion TV series. The fourth film will have a completely new conclusion, and the films have diverged from the TV series, making them a great watch for both new and old Evangelion fans.